📍Ubud, 31st of August 2018. 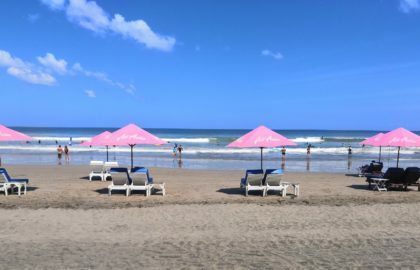 We did rant before about Ubud and the surroundings being full of tourists, but don’t let that discourage you – there are a lot of interesting places to see, many of those are not crowded at all, depending on your timing. We found that for us the best way to explore the island was either by walking or by renting a scooter, which is possible from pretty much from any homestay or, naturally, the motorbike shops. Prices may vary a bit, but if your time is worth you more than 1-2 euros saved, just go with the most convenient option. We rented our scooter in our lovely homestay. The cool thing is that we could always decide spontaneously whether we wanted to go somewhere that day, depending on the weather and the mood. 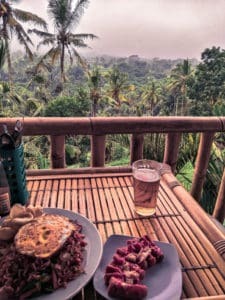 Speaking of weather, Ubud is much more chilled than the South of Bali. 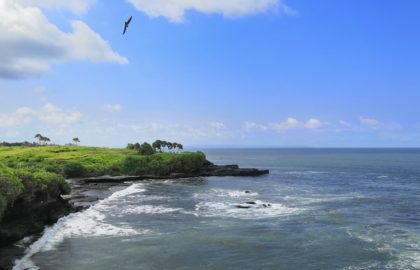 Surrounded by forests and rice fields, it has much milder temperatures and more rainfall. The rain never lasted too long though and was very refreshing, not blocking us from any activities planned. So where did we go and what did we see? Here below are top three things we saw besides temples and waterfalls we have covered in separately. 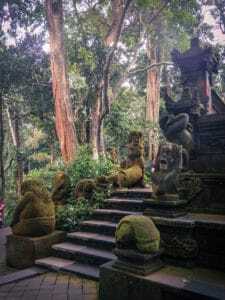 The centrally located Ubud Monkey Forest is one of the most popular attractions in the area. 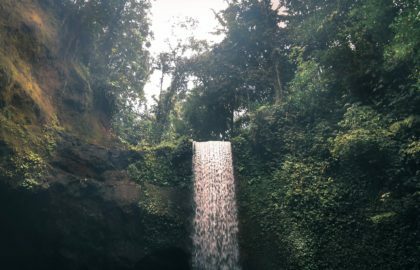 We had heard about the forest long before we even came to Bali, so the visit was highly anticipated. 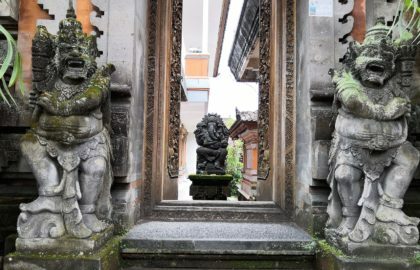 Like with most things in Bali, the sanctuary’s philosophy is closely related to Hindu spiritual beliefs, seeing its mission to conserve the area based on the concept of Tri Hita Karana or “three ways to reach spiritual and physical well-being” (see their website for more information). The moment we entered the sanctuary, we started feeling like we were in a different, somehow magical world promising an exciting adventure. I think it has to do with the park layout. 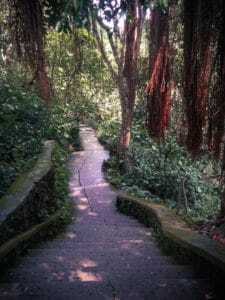 The road took us along temples, passages and paths surrounded by tall trees with massive roots, transferring us into the world of Indiana Jones and Tomb Raider. This was so cool! We had a lovely stroll for about 2-3 hours, meeting the 5 monkey families/clans inhabiting the forest. 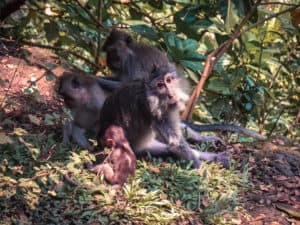 These groups are protective of their territories, so at the border areas we witnessed a couple of intense fights when some uninvited monkey guests were spotted. Glad that strict border control didn’t apply to us . When not busy with defending their habitat, the monkeys go about their lives just like we do – they eat, play, take care of each other and make out. 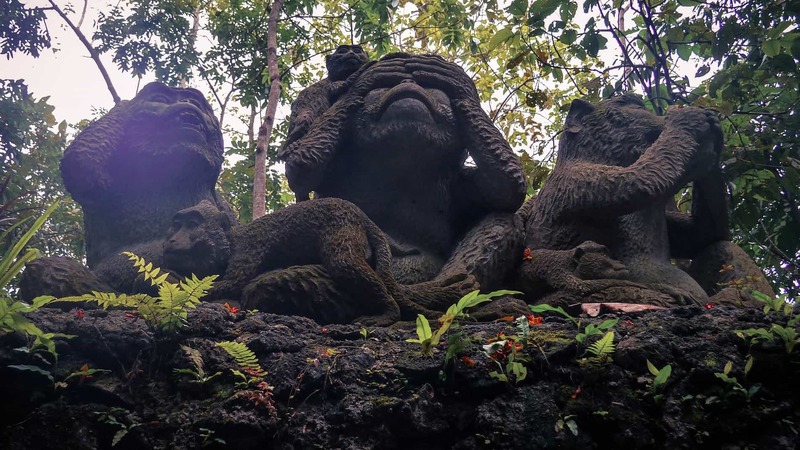 Some reviewer on TripAdvisor wrote they were disappointed monkeys weren’t doing anything interesting – not sure what did they expect? On the contrary, we found it was very entertaining to watch monkeys do “ordinary things” undisturbed by the presence of visitors. (we actually made a couple of videos, but will post the compilation once we have an internet connection which doesn't require 10 mins to upload a picture ). There is a long list of regulations and instructions at the entrance, discouraging visitors to feed the animals and giving guidelines on how to behave. 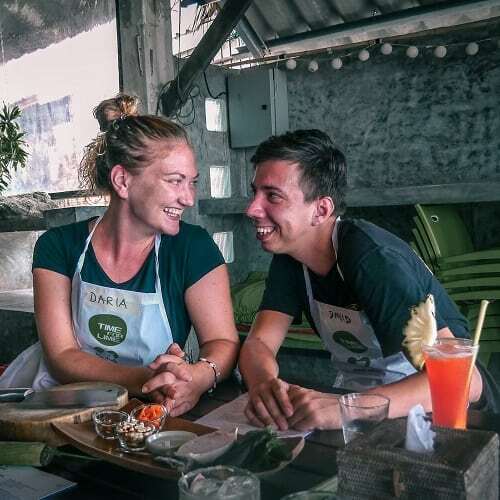 Having gone through the “masterclass on monkey interactions” back at the Uluwatu temple, we were mentally and physically prepared for the encounter. Not everyone was on the same page, so you could repeatedly hear someone scream in shock when a monkey approached them to check out their curious backpack (“I’m sure there is something yummy in there if only I could open that zip lock”) or hiss and show their teeth as a response to a prolonged eye contact (“stop staring at me!”). My backpack also underwent a tedious investigation, but unfortunately for the investigator and fortunately for me, the zipper was too challenging to open. Having travelled on my back for good 5 minutes, the inspector eventually gave up and switched focus on a new suspect. David wasn’t particularly amused nor at ease with all of this and tried to keep a healthy distance from the real sanctuary managers. This worked and to his relief no monkey interactions were made. Definitely a fun afternoon! This is probably one the most instragrammed places on the whole island. And no wonder they are. 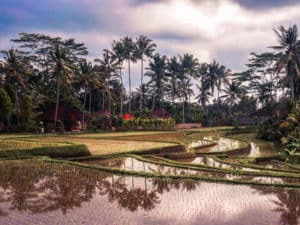 These rice fields are set up on the hill slopes creating a picturesque scenery with multiple layers connected by narrow passages providing a multitude of instagrammable opportunities. The challenge here, however, is to find a hidden spot with no other aspiring photographers or come very early in the morning. Since we only left in the afternoon, we arrived at the rush hour. The street adjacent to the rice fields was cramped with people and little shops selling textile, woodwork and other souvenirs. We stopped our scooter at an empty spot and immediately got approached by a man wearing a uniform. There was a “no parking” sign, although there were tens of scooters parked on the street. The man wanted 10k IDR. Not willing to pay what we considered to be a steep fee (usually a parking fee, if there is any at all, is between 2 and 4k IDR), we told the man we would look for a different spot – we thought we’d just park somewhere outside and walk back. The man then reassured us that the 10k wasn’t for parking since the parking is free and was rather an entrance fee. I’m glad the man had the decency not to charge us 20k despite our request for 2 tickets, as it turned out later there was no entrance fee at all. 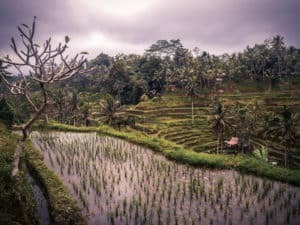 You are however expected to pay a couple of not-optional donations (something like 10-15k seems to be the going rate) as you make your way through the rice fields. We thought it was ok since the rice fields are a private property and the farmers let hundreds of people walk through their farms. Just wonder if the rice fields are still kept for agricultural purposes or merely as a decoration for all the visitors. We tried to engage with a couple of “gate keepers” eager to learn more about how the rice is grown and harvested, but unfortunately due to the language barrier it was impossible to have a proper conversation. 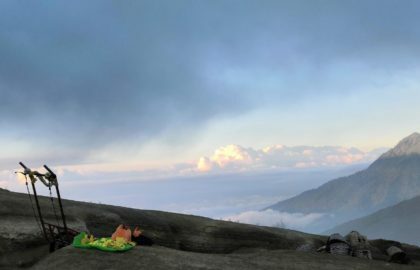 If we were to see Tegallalang again, we would go there around sunrise, park the scooter elsewhere and explore the fields before the “business hours”. Wanting to escape the crowds, we jumped on the scooter and drove off. Passing through a tiny village we found a small restaurant with a wooden terrace overlooking gorgeous rice fields and the jungle (could not find it anymore on google, but it was somewhere here). Feeling satisfied with ourselves by having found this hidden place, we enjoyed a cold beer and the view. As we later concluded, there are hundreds of beautiful rice fields all around the island, maybe not as scenic or famous as Tegallalang, but surely not as crowded either. For uninterrupted pictures with/on/in front of rice fields, would recommend just jumping on a scooter and finding your own little rice field heaven ;). 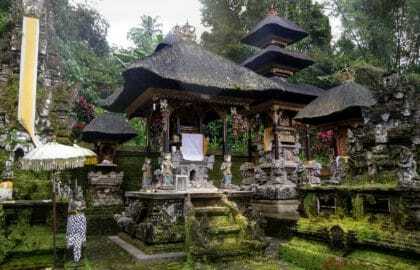 This is a nice walk outside of Ubud, nothing more but nothing less. We saw a couple of websites calling it a “trek” which is a bit misleading and contributes to some feeling disappointed. It is rather a hike, I’d say. It starts with a steep-ish road which then turns rather flat for the rest of the journey and takes you through green fields, forests and a small village. Although there are no particularly breath-taking views, we really enjoyed the relaxing stroll chatting about our future travel plans and all sorts of other random ideas. We didn’t continue the walk as most do and ended up going through quiet rice fields, meeting almost no one else, except for some locals humorously complaining about the lack of business (location, location, location, sir!). 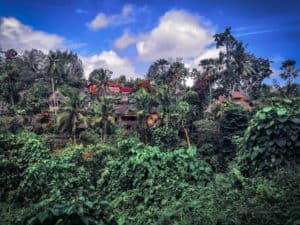 Once we felt we had walked far enough, we turned around and looked for a turn to go back to Ubud using a different path. It was more challenging and more adventurous as the road went rather steeply up and down a couple of time, forcing us to take mini breaks and amuse the passing lift-offering drivers. A part of the walk led through gorgeous private villas inspiring us to dream out loud, how would it be living here in such a villa, how we would get around and how we would gather our friends for fresh fish bbq parties. 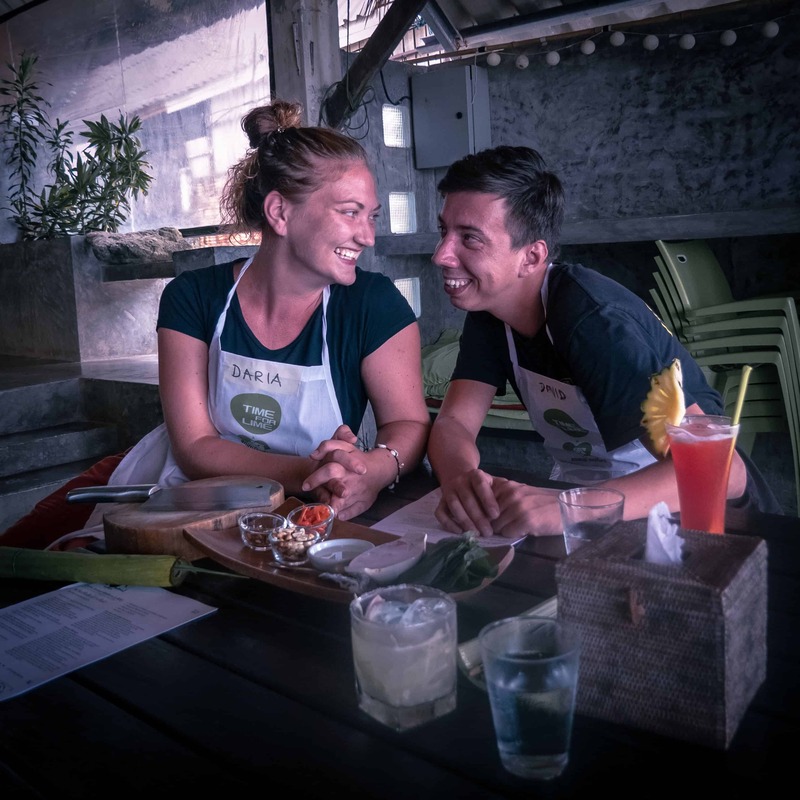 David is obsessed with the idea of opening up a small restaurant serving “real good burgers” and Czech beer. I just wonder, who is going to cook all of that? Other than that, fantasizing about it was pretty exciting.